Arboretum apprentice Amanda Philbin holds a bouquet of flowers and foliage from some of the plants that will be available at the Fall Plant Sale. Photo by S. McCabe. The UC Santa Cruz Arboretum will hold its annual Fall Plant Sale on Saturday, October 8, from noon to 4 p.m. at the Eucalyptus Grove on High Street near the intersection of Western Drive. Held in conjunction with the California Native Plant Society, the sale opens early (from 10 a.m. to noon) for members of either organization. Memberships will be on sale at the gate. To make the event more festive, free plants will be given away each hour from noon to 3 p.m. There will also be a drawing for protea, pincushion, leucadendron, and other plants at 11 a.m. during the members-only period. You must be present to win. The sale will feature an unusual selection of native and non-native species chosen to thrive in local gardens. A complete list will be available on the Arboretum's web site. Fall is a good time for planting because roots can establish themselves during the rainy season, which makes for a stronger and healthier plant to withstand the dry summer. "Planting drought-tolerant plants in the fall saves water and energy. Because of the energy required to deliver water to the spigot, fall planting reduces one's carbon footprint compared to planting water-loving plants in spring," said Stephen McCabe, director of development and research at the Arboretum. In the aftermath of budget cutbacks, which forced the Arboretum to lay off another staff person in August, the plant sales have taken on added importance as fundraisers to keep all of the remaining staff employed, said Arboretum director Brett Hall. "For this sale, many volunteers have helped students and staff propagate beautiful plants in time for the fall planting season," Hall said. In addition to plants with different textures and origins for your garden palette, there will be flowers and foliage in all colors, from white to black, with a rainbow of floral colors in between. 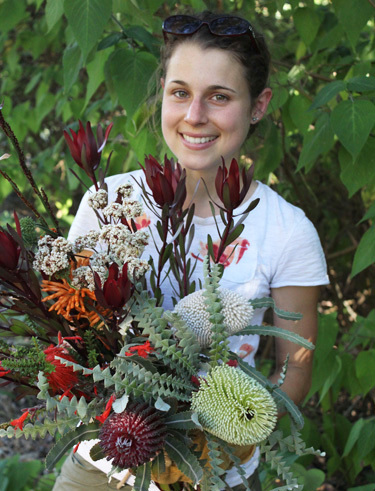 The sale will also feature some dramatic and lesser-known members of the protea family: Australian banksias with large, bottlebrush-like flowers and South African leucadendrons with attractive foliage in yellow, burgundy-red, and tricolored variegated forms. A variety of succulents from California, Mexico, and South Africa will also be available. Many succulents are perfect plants for dorm rooms as well as the home garden, according to McCabe. For more information about the sale, contact the UCSC Arboretum at (831) 427-2998 or visit the Arboretum's web site or Facebook page. The Arboretum is open from 9 a.m. to 5 p.m. every day. Norrie's Gifts is open daily from 10 a.m. to 4 p.m.